To Cite: Nazar E, Azmoudeh-Ardalan F, Mobedi I, Dashti S H, Salahshour F, et al. Fasciola Hepatica in Explanted Cirrhotic Liver of a Patient with Chronic Hepatitis B Virus Infection: An Accidental Finding, Hepat Mon. 2017 ; 17(11):e61214. doi: 10.5812/hepatmon.61214. Introduction: Fasciola hepatica infection is frequently asymptomatic and may be neglected. However, severe conditions may be symptomatic due to stimulatory effects of the liver fluke in the liver. Case Presentation: The present report describes a rare case of fascioliasis accidentally discovered in the explanted liver of a patient with cirrhosis due to chronic hepatitis B virus (HBV) infection. Conclusions: Liver fluke infection may occur in cirrhotic livers. Thus, minute evaluation of liver explants for possible parasitic infestations including F. hepatica is suggested, particularly in endemic areas. Fascioliasis caused by the liver fluke Fasciola hepatica is an important primary veterinary disorder as well as a human secondary disease (1). This flat-worm trematode enters the human body through digestive tract and lives in the common and hepatic bile ducts (2). The public health importance of human fascioliasis is now increasing due to its global spread as well as appearance of its considerable complications. Early infection with F. hepatica is frequently asymptomatic and may be neglected; however, in more severe conditions, stimulatory effects of the liver fluke can lead to proliferation and inflammation of biliary tracts and subsequently to hepatic fibrosis, biliary tract obstruction, cholangiocarcinoma, and even hepatocellular carcinoma (3). Furthermore, hepatic tissue damage as well as cirrhosis may appear as a result of hepatic cells injury (4). The present report describes a rare case of fascioliasis accidentally discovered in the explanted liver of a patient with cirrhosis due to chronic hepatitis B virus (HBV) infection. A 58-year-old female with diagnosis of cirrhosis in the background of chronic HBV infection was referred to Imam Khomeini Hospital Complex for orthotopic liver transplantation. Initial laboratory assessment showed a marked increase in alkaline phosphatase (ALP) as well as increased serum total and direct bilirubin level along with slightly elevated alanine aminotransferase (ALT) (aspartate aminotransferase (AST): 33 IU/mL, ALT: 84 IU/mL, ALP: 565 IU/mL, total bilirubin: 3.7 mg/dL, direct bilirubin: 2 mg/dL) and MELD (the model of end-stage liver disease) score of 17. Pre-transplantation evaluations showed a mass (suspected of hemangioma) in segment 4b and a fibrocalcified focus in segment 4a without other remarkable findings (Figure 1). Therefore, the patient underwent orthotopic liver transplantation. The histopathological assessment of explanted liver indicated active cirrhosis with large cell changes in some nodules. 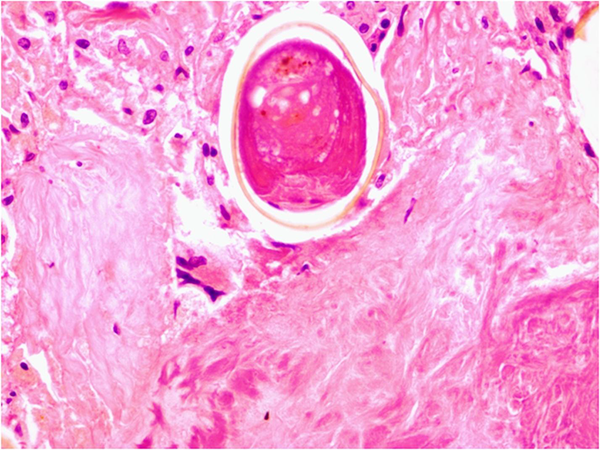 Further assessment revealed a necrotic hyalinized nodule harboring non-viable parasite in the peripheral regions of segment 4a (Figure 2). Also, small bile duct hamartoma was identified in a microscopic focus in segment 4a. A hemangioma measuring 1 cm was also found in segment 4b. The extrahepatic biliary tracts were unremarkable. No evidence of malignant change was detected. A demised degenerated worm that was morphologically consistent with F. hepatica was identified in the necrotic hyalinized nodule (Figure 2A and B). Eggs of this parasite were also found in the surrounding tissue (Figure 3). Follow-up of the patient showed good recovery after treatment with triclabendazole. The patient is alive and healthy without any major problems 2 years after transplantation. Figure 2. A, Demised fluke is evident in the necrotic background, separated by dense fibrotic tissue from liver parenchyma. H&E, X100. B, Schematic drawing of the worm. H and E stain, X400. Recent studies showed an elevation in the incidence of liver fibrosis, cholangitis, cholecystitis, cholelithiasis, cholangiocarcinoma, and even hepatocellular carcinoma following liver fluke infection (5, 6). A systematic review showed an eightfold risk of cholangitis, fifteen-fold risk of cholecystitis, threefold risk of cholelithiasis, and fivefold risk of hepatocellular carcinoma following fascioliasis. However, the current study could not indicate a powerful relationship between this infection and cirrhosis. In fact, discovering liver fluke infection in patients with cirrhosis is a condition rarely reported (7). Some probable mechanisms are described for development of cirrhosis following liver fluke infection. A recent study suggested that F. hepatica infection was associated with the upregulation of mRNAs associated with hepatic fibrogenesis in vivo and in activated hepatic stellate cells (8). Furthermore, the liver fluke may secrete some metabolites that can play an immunogenic stimulatory role leading to strong humoral immune responses (9). In fact, the presence of parasite antigens in various hepatobiliary portions such as biliary epithelium and its surrounding tissue can facilitate inflammatory cell infiltration and also activate host immune responses (10). According to the current study findings, the development of liver fluke infection is expected in patients with cirrhosis, and thus, minute evaluation of liver explants for possible parasitic infestations including F. hepatica, particularly in endemic areas is suggested. Authors’ Contribution: Elham Nazar, collection of clinical data, histopathologic evaluations, and drafting of the manuscript; Farid Azmoudeh-Ardalan, histopathologic evaluations and editing the manuscript; Iraj Mobedi, identification of the parasite and drawings of the worm; Seyed Habiballah Dashti, surgery and pre-operation practices on the patient; Faeze Salahshour, radiologist of the transplantation team and review of diagnostic images; Zahra Ahmadinejad, infectious disease consultant. Implication: F. hepatica may infest cirrhotic livers; post-transplantation flare up of fascioliasis can also be problematic. Therefore, biliary system and liver parenchyma of explanted livers should be comprehensively evaluated for potential infestations in endemic areas.